PRIMARY FILIPINO LANGUAGE TV PACKAGES. *BASE DISH PROGRAMMING PACKAGE REQUIRED. Filipino: GMA Pinoy – $19.99/mo. 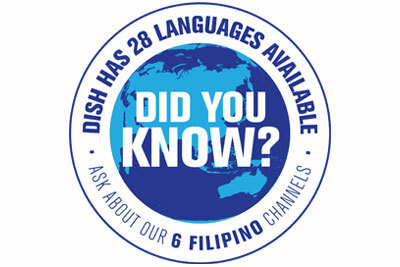 The GMA Pinoy Pack from DISH offers the highest rated Filipino news, game shows, sitcoms, soap operas, talk shows, and AM/FM radio programming. To order the Filipino: GMA Pinoy Package, contact your friendly DISH representative today. Filipino: Pinoy Mega Pack – $24.99/mo. The best Filipino sports, news, movies, and music programming is waiting for you with the Pinoy Mega Pack from DISH. This exciting international package includes popular entertainment and radio channels. To order the Filipino: Pinoy Mega Package, contact your friendly DISH representative today. CHINESE CHANNEL ADD-ON PACKS. *INTERNATIONAL BASE AND PRIMARY INTERNATIONAL CHANNEL PACKAGE REQUIRED. Filipino: TVB8 (ADD-ON) – $5/mo. TVB8 brings you the best Mandarin language programming from China, Taiwan and Hong Kong. This top network features a wide variety of hit dramas and sitcoms and also broadcasts plenty of news, entertainment reports, interviews, talk shows, travelogues and music programs! To order the Filipino: TVB8 Pack (ADD-ON) Package, contact your friendly DISH representative today.